We had our Sunday Ultimate game called because of rain this afternoon. We were up 9 - 4 at half, and then most people decided they didn't want to continue. This season's Ultimate seems to be jinxed, I have yet to get in a good game. Last two Sundays there were problems with the permits, this week rained out; and on Wednesdays there's way too many guys. On Wednesdays we've decided to sit out two guys a week, so that we only have six guys (there's four guys, two girls on the field on Wednesdays). I've put together a schedule and emailed it out. 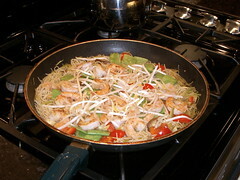 On Tuesday we had Singapore curried noodles with shrimp, a recipe from the LCBO Food and Drink magazine. We've found some really good recipes in the magazine, (also available online). On Thursday we had a late hockey game, a scheduled 11:30pm start. However, when we got there, we found they were running a game behind. We didn't get on the ice until 12:15am. Fortunately players on both teams stuck around, and we won 2-0, in a good game. The league is now managed by Canlan Ice Sports, and I can't say I'm impressed. They have a 5-minute OT even in regular season (so I can see the games being delayed every week), and the ice has been in bad condition the first two weeks. I decided to take Friday off, partially because of the late hockey game, and also because I have a lot of vacation to use up this year. I painted a 2nd coat on the door frame (so that's done now), and tried to figure out how to replace the rest of the posts on the front deck. There's six posts, three against the house (3"x6"), and three out front (6"x6"). Two are ours, two are the neighbours, and the middle two are shared. I replaced our front 6"x6" in spring, because it was rotting and falling off the support. The replacement is pressure-treated with chamfered corners, so it doesn't really match the rest. I found some lumber yards that sell 6"x6" with non-chamfered corners (although not square); but couldn't find anyone who would rip those into 3"x6"; or anyone that sold 3"x6". The originals are about 50 years old, and are true 3"x6". So after discussing with Heather, we decided to re-replace the 6"x6" front posts with non-chamfered pressure-treated posts (both ours and the shared one); and strip the paint from the 3"x6" rear posts. I also have to replace the old railing / divider that separates the deck from the neighbour. I've heard different opinions on painting pressure-treated wood, and I'm going with the "leave it out for a season" one. I'll paint the posts and railing in the spring (white, to match the window and door frame). Also looked at replacing the gutters and downspouts. The brown paint is peeling on the current ones, and they're dented and bent. I checked out Home Depot and found that replacing them with vinyl isn't that expensive. But that may have to wait until spring (along with replacing the green shingles over the deck with black, and replacing the painted green wood shingles against the 2nd floor exterior with cedar shingles). Yesterday Heather and I went to the 1st Annual Leslieville Catfish festival, down at Jimmy Simpson park. There was a pretty good turnout from the community. We had catfish, coleslaw and sweet potato frites which were excellent. Tried three different hot sauces, one of which was extremely hot. Heather burnt her tongue on the hottest one. Got home before the rain started. Ordered some more loose leaf tea from Capital Tea. Heather also added some chai tea and a peppermint tea to the order. Anyways, I should go cook dinner. We're having spaghettini with clams in a white wine sauce. The clams are canned bar clams straight from PEI; I haven't found them sold in Toronto yet.